Dina Wakley Media Journal - 10ins x 14.25ins. The Dina Wakley Media Journal is a larger size for even more mixed media fun! It includes burlap, canvas, cotton rag watercolor paper and kraft surfaces. 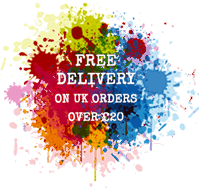 Use with Dina Wakley Media Acrylic Paints, Mediums, Gessoes, Scribble Sticks and more. The Media Journal features 54 pages to fill with memories and inspirations. Due to the handmade nature of this product, imperfections and frayed edges are intentional by design.